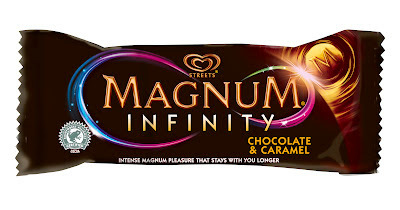 I remember when Streets Magnum first entered the market - Rich and Indulgent, I just had to try each and every one! Once again, Magnum has introduced a new variety - Magnum Infinity. Made with rare Tanzanian cocoa, this one promises to give us a heightened chocolate pleasure experience. Why? you may ask - Well, it has something to do with a high concentration of theobromine contained in the cocoa. This phytochemical is scientifically proven to have a mild stimulating effect. 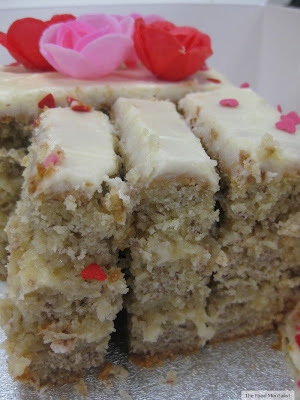 What I really love about this product (apart from the taste of course! 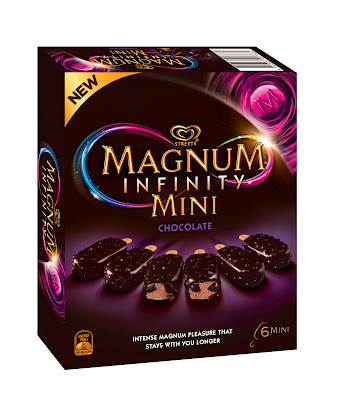 ), is that the cocoa contained within the Magnum Infinity is actually sourced from Rainforest Alliance Certified farms which means that the cocoa farms operate under a set of ethical standards set out by the Sustainable Agriculture Network (SAN) - a coalition of nonprofit conservation organisations which address environmental, social and economic criteria. Available in two flavours, Chocolate and Caramel (100ml) and Chocolate (60ml). Both are a combination of indulgent chocolate ice cream, covered in dark chocolate and real cocoa nibs. The Chocolate and Caramel variety also has a caramel ice cream swirl throughout the chocolate ice cream which helps to balance the intensity of the chocolate. I especially love the mini chocolate variety because they make the perfect after dinner indulgence. Magnum Infinity can be purchased at all major retail outlets. For your chance to win this pleasure pack, all you have to do is like The Food Mentalist on Facebook here and leave a comment below telling me why you love Magnum. The competition closes at midnight AEST on the Sunday 13th May 2012. Open to Australian residents only. Please leave your name along with your comments and I will contact the winner through Facebook. I love Magnum because its chocolate, chocolate, chocolate! i luv magnum because it really hits the spot..boom boom..
Mmm I love magnums, they're my special treat! Magnums (magna?) are our road trip treat. Petrol for the car, Magnum for the driver. Love to dark chocolate shell. I love Magnums because they're two treats in one. First, eat the chocolate off the outside (no other chocolate shell cracks as deliciously as a Magnum's). Then, enjoy the ice cream! Each element is individually awesome! I love every part of a Magnum. From unwrapping the crisp foil wrapper to reveal the deliciously,devilish Chocolate treat, to cracking through the crunchy chocolate shell, to the very last mouthful, pure pleasure. I wish my Magnum lasted for Infinity. What I love most about this ice cream is it's rich Belgian chocolate coating. However, I got toothaches after eating two in a row. I visited my dentist in Concord and I found out that my teeth are too sensitive. I have to buy a toothpaste then that's going to help me with my sensitive teeth.